The Bernard Shaw Prize for translation from Swedish was awarded to Frank Perry for his translation of Bret Easton Ellis and the Other Dogs by Lina Wolff, published by And Other Stories. Deborah Bragan-Turner was runner-up for her translation of The Parable Book by PO Enquist, published by MacLehose Press. Congratulations to Frank and Deborah. The Society of Authors' Translation Prizes evening was held on the evening of 13 February. The Bernard Shaw Prize was established in 1991 and is awarded triennially. Its current sponsors are the Embassy of Sweden and the Anglo-Swedish Literary Foundation. Past winners include Robin Fulton, Thomas Teal, Sarah Death, Anna Paterson, Michael Robinson, David McDuff and Tom Geddes. At our AGM in November, Ruth Urbom stepped down as Chair of SELTA. On being voted in as the new Chair, Ian Giles thanked Ruth for her sterling work in helping to shape SELTA into an exciting organisation for new and established translators (members can read the minutes of the whole AGM in the Members' Area of the website). Ian sums up the past year and looks ahead to 2019 in a blog post here. Peter Graves' translation of The Emperor of Portugallia by Selma Lagerlöf (Norvik Press, 2017) and Fiona Graham's translation of 1947 by Elisabeth Åsbrink (Scribe Publications, 2017) are among the 15 books longlisted for the 2018 Warwick Prize for Women in Translation. Read more about the Warwick Prize, now in its second year, and see the other longlisted books by women in translation here. SELTA's autumn translation workshop will be held on 19 September 2018. We will be comparing translations and discussing approaches to an extract from Angela Ahola's book Konsten att göra intryck (Natur & Kultur, 2016). Venue: Alströmer Suite, Embassy of Sweden, 11 Montagu Place, London. Attendance is free of charge to SELTA members but please register by the deadline of 12 September using this Eventbrite link. Applications are now open for the National Centre for Writing Emerging Translator Mentorship Programme 2018-19. Swedish is one of the languages represented this year, with mentor Sarah Death, thanks to support from the Anglo-Swedish Literary Foundation. Details on how to apply can be found here and the application deadline is 9 am on 3 September. SELTA members who have benefitted from the programme in its previous incarnations would strongly recommend applying if you are early in your literary translation career. As the FAQ states, "applications from translators with commercial experience are encouraged". Good luck! We are sad to hear the news of the death of SELTA member Martin Murrell on 23 June 2018. Martin was born in London in 1937 and studied and worked in teacher education at a number of universities in England and overseas. After retiring in 1996 he continued to undertake academic and literary translation. He and his Finland-Swedish wife Anna-Lisa, who died in January last year, translated a number of Swedish works together, the first of which was Runar Schildt's story The Weaker One, published in Swedish Book Review in 1999. SELTA members remember Martin's love of Scandinavian folktales and his brilliantly atmospheric oral storytelling. We appreciated having him and Anna-Lisa in our ranks as a translating duo and remember him as a polymath, a music lover and a valued, thought-provoking, contributor to our online forums and workshops, and, of course, to Swedish Book Review. The winner of the Crime Writers' Association International Dagger 2017 for crime novels not originally written in English is Leif G Persson's The Dying Detective, translated from Swedish by SELTA member Neil Smith. The meeting will be followed by a talk from Ros Schwartz. This year's Edinburgh International Book Festival is doing its bit for Nordic authors and SELTA member Ian Giles has put together a handy list of Nordic-themed events below. The festival runs from 12–28 August 2017 and tickets can be booked here. Brexit. Trump. Gloom. Doom. But, argues leading Swedish commentator Johan Norberg in Progress, that’s not the whole story. Every day for the past 25 years, 285,000 more people have been able to drink clean water, and similarly vast numbers are daily escaping poverty, illiteracy and disease. The case for global optimism might be stronger than we think. Christmas 1983 in a small Norwegian town, a young police officer investigates an unsolved mystery which will shape his life for the coming years. Jorn Lier Horst devotees will be delighted to learn of the prequel to the bestselling William Wisting series, When It Grows Dark. Former policeman and journalist Denzil Meyrick’s Well Of The Winds has DCI Daley going back to Kinloch during the Second World War for his own cold case. Our thirst for compelling European crime fiction seems unlikely to ever be quenched, so thank goodness for the likes of Martin Holmén and Michael J Malone. The former’s Down for the Count is a no-holds barred Swedish thriller about a former boxer hell-bent on vengeance having just been released from jail, while the latter’s Dog Fight has been dubbed as Glasgow’s Fight Club. Chaired by Joe Haddow. the celebrated bestseller from Karolina Ramqvist, an intimate portrayal of a woman’s downfall through her complicit relationship with the world of crime. Shortlisted for last year’s Man Booker International Prize, translator Daniel Hahn was a judge of this year’s contest. In today’s event, Hahn and two of the translators shortlisted for the 2017 prize talk about their roles interpreting novels for an English- speaking audience. What are the different challenges of translating from Hebrew, Spanish, French, Norwegian and Danish, and what special tests did the shortlisted books hold? Chaired by Nick Barley. steps of a tragic climb. Two international bestselling authors, the same page-turning excitement. Chaired by Daniel Hahn. for Scotland? In Northern Neighbours: Scotland and Norway Since 1800 editors John Bryden and Lesley Riddoch draw historical comparisons between the two countries on a whole range of subjects, many of which might well inform another independence debate. A key figure in Nordic Noir teams up with a Tartan Noir stalwart. Kjell Ola Dahl has just published Faithless, another tale for his Oslo detectives Gunnarstranda and Frølich to get their teeth into, as a woman’s body is found wrapped in plastic. Alex Gray’s Still Dark reacquaints us with her DCI sleuth, William Lorimer, as a New Year’s Eve is disturbed by carnage at a Glasgow house party. Norway’s internationally bestselling author of Norwegian Wood, Lars Mytting brings us his latest novel, The Sixteen Trees of the Somme, a deeply moving family story of epic scale. The Dark Room, by Rachel Seiffert, was shortlisted for the Man Booker Prize, and with her latest story, A Boy in Winter, she again packs an emotional punch, focusing on three days after the SS invade a small Ukrainian town in 1941. Chaired by Claire Armitstead. man who had raped her 20 years earlier. Meanwhile, New Zealander Courtney Sina Meredith talks about her debut book of short stories Tail of the Taniwha. is the first of his seasons quartet, a personal encyclopedia about the world that he began as a letter to his then unborn daughter, the youngest of his four children. Chaired by Roland Gulliver. There’s no getting away from Scandi noir – even in Scotland. In Lin Anderson’s Follow the Dead, a fatal helicopter crash in the Cairngorms seems to reveal a Norwegian government minister’s involvement in a vice ring. Meanwhile, Antti Tuomainen, ‘the king of Helsinki noir’ arrives with The Mine, a tale of a deadly environmental disaster cover-up. The vulnerability of young girls is the sad heart that beats through new novels from ex-Met detective turned author Kate London and bestselling Icelandic crime writer Yrsa Sigurdardottir. The former’s Death Message begins in 1987 with a missing 15 year old. In the latter’s The Legacy, a 10 year old is the only witness to her mother’s brutal death. Two elegant, intimate novels explore the ghosts of 20th century Europe that haunt those trying to move on. We welcome back Otto de Kat, whose new novel, The Longest Night, is the story of 96 year old Emma coming to terms with her past. He is joined by Finnish writer Arja Kajermo, a much-loved Dublin-based cartoonist. Her darkly comedic talents are also evident in her debut novel The Iron Age – illustrated by her niece – which draws on her childhood to tell a coming of age fairy tale in post-war Scandinavia. and you must flee to safety in the Middle East? Teller joins Lina Meruane, one of the most prominent female voices in Chilean literature, with Seeing Red, her visceral, haunting English language debut about the body and human relationships. Part of European Writers’ Tour 2017.
in harmony with nature and each other. Two beautiful works about people and the natural world. Black Water Lilies by bestselling French author Michel Bussi is named after a rumoured Monet masterpiece, which seems to be a magnet for murder. Sweden’s Arne Dahl, whose novels have already been translated into over 30 languages, launches a new series with Watching You, where a serial killer seems to be toying with his detective. Join them for a feast of the finest European fiction. Chaired by Jenny Brown. Dark secrets and past sins link the latest novels by Scotland’s Michael J Malone and Norway’s Agnes Ravatn. In Malone’s A Suitable Lie, a widowed father finds love again, but his new bride may not be all she seems. Ravatn’s The Bird Tribunal sees a woman exiled to an isolated fjord. There she begins an obsessive relationship with a curious stranger. Two compelling psychological dramas. Chaired by Philip Ardagh. SELTA membership reaches new milestone! We now have 70 SELTA members! We include award-winning translators of Nordic Noir and literary fiction, emerging literary translators and postgraduate students. See our Join SELTA section for details of how to join and the Directory of Members for profiles of some of our members. It's great to see SELTA going from strength to strength in 2017. Frank Perry has won the Oxford-Weidenfeld Translation Prize for his translation of Bret Easton Ellis and the Other Dogs by Lina Wolff. Read more from publisher And Other Stories here. In Red Magazine this May, Hélene Fermont introduces "10 Scandi books you have to read that aren't crime". From Strindberg and Lagerlöf to Lena Andersson, there's plenty for readers to get their teeth into. Read the whole article here. The shortlist for the Petrona Award 2017 for the Best Scandinavian Crime Novel of the Year includes The Dying Detective by Leif G.W. Persson and The Wednesday Club by Kjell Westö, both translated by Neil Smith, and The Bird Tribunal by Agnes Ravatn translated from Norwegian by Rosie Hedger. Congratulations to all the shortlisted authors and translators. Read on for the full list. The winning title will be announced at the Gala Dinner on 20 May during the annual international crime fiction event CrimeFest, held in Bristol 18-21 May 2017. The award is open to crime fiction in translation, either written by a Scandinavian author or set in Scandinavia and published in the UK in the previous calendar year. The London Book Fair is a major networking opportunity for translators. The Literary Translation Centre has a rolling programme of interesting translation-related panels across all three days and you are sure to meet up with fellow translators either in the (limited) seating area or listening around the sides. The Nordic Stand, another magnet for Nordic translators is at 6F70. If you're going to be in London for the fair and need a break from talking to people at Olympia, or are arriving early or staying on after the event, London currently offers other Scandinavian themed activities. The Moomin Exhibition is on at the Southbank Centre until 23 April 2017. The Josef Frank Exhibition is on at London's Fashion and Textile Museum until 7 May. The shortlist for the 2017 Nordic Council Literature Prize has been announced today. Sweden's nominees are poet Ann Jäderlund and writer Birgitta Lillpers. Åland's nominee is Johanna Boholm, while Finland-Swedish poet Tomas Mikael Bäck also takes one of Finland's nominations. Congratulations to all! See the full shortlist here. Named after August Strindberg, Sweden's August Prize is awarded by the Swedish Publishers’ Association for the best Swedish books of the year. This year's awards were announced at a gala night at the end of November. The winners of the 2016 August Prize, pictured here, were annouced at a gala night at Stockholm's Konserthuset at the end of November. Best Swedish Non-Fiction Book of the Year: Gutenberggalaxens nova. En essäberättelse om Erasmus av Rotterdam, humanismen och 1500-talets medierevolution (The nova of the Gutenberg galaxy. Erasmus of Rotterdam, humanism and the sixteenth century media revolution) by Nina Burton, published by Albert Bonniers Förlag. Best Swedish Children’s Book of the Year: Tio över ett, (Ten past one) by Ann-Helén Laestadius, published by Rabén & Sjögren. The Edinburgh International Book Festival​ programme for 2016 features a number of Swedish language writers, as well as a significant number of other Nordic authors. Tickets go on sale on 21 June and can be booked via the festival's website. Applications have opened for the 2016 edition of the Writers' Centre Norwich Emerging Translator Mentorships, previously run by the BCLT. The translation mentoring programme aims to develop successive new cohorts of literary translators into English, particularly for languages whose literature is currently under-represented in English translation. The scheme matches up experienced translators with emerging translators for a six-month period during which they work together on practical translation projects, developing their craft through working on a chosen text or texts. Sarah Death, a SELTA member and former editor of Swedish Book Review, will be the mentor for Finland-Swedish, thanks to the generous support of FILI. The evidence of the scheme to date suggests that participation in the scheme represents, in itself, a significant professional development for mentees, with publishers seeing the mentoring cohort as a reliable source of high quality emerging translators. Several SELTA members are graduates of the previous incarnations of the programme. The programme is open to emerging translators at no cost to them. An emerging translator is someone who has published no more than one full length work of translation. MFA and MA students in translation can apply, but priority may be given to those who do not have access to the kind of guidance already present in a translation degree programme. To find out more about the programme and how to apply, visit the WCN website here. The spring 2016 issue of Swedish Book Review turns the spotlight on the late Laurie Thompson, a translator who stands out for his skill and mastery. Laurie Thompson, editor of SBR for twenty years, who died in June 2015, will be remembered for his leading role in the promotion of Swedish literature in the English-speaking world, not least for the significant part he played in introducing British readers to Scandicrime and the ensuing publishing boom. In this issue his friends and colleagues share their personal memories of a very modest man and his outstanding achievements. And their words provide a unique insight into the meeting of academia, translation and publishing in Laurie’s lifetime. You can read the whole tribute here. The Bernard Shaw Prize for translation from Swedish was awarded to Thomas Teal, with Sarah Death receiving a commendation. Read on for further details. Thomas Teal, who was involved in the discussions to set up SELTA, and indeed coined the name and acronym of our organisation, won the £2000 Bernard Shaw Prize for his translation of Tove Jansson's The Listener published by Sort of Books. In their winner's citation, the judges (Karin Altenberg and B.J. Epstein) noted: "This gorgeous collection of short stories is deceptively simple. As in most of Tove Jansson's works, though, both the words and the silences in between them matter. Thomas Teal seems to have slipped into Jansson's skin in order to bring her smart, touching writing into English." SELTA member and Swedish Book Review editor alumna Sarah Death was commended by the judges for her translation of A Brief Stop on the Road from Auschwitz by Göran Rosenberg published by Granta. The judges said "Rosenberg's book explores a powerful and painful family story in a creative, almost novelistic style. Sarah Death has managed to translate this lyrical, moving work beautifully and precisely." The Society of Authors' Translation Prizes evening was held on the evening of 17 February at Europe House in London. The Bernard Shaw Prize was established in 1991 and is awarded triennially. Its current sponsors are the Embassy of Sweden, the Anglo-Swedish Literary Foundation and Arts Council England. Past winners include Robin Fulton, Thomas Teal, Sarah Death, Anna Paterson, Michael Robinson, David McDuff and Tom Geddes. 2015 was another busy year for SELTA. Read about it in full in the story below. Despite the sad loss this year of two of SELTA's most eminent members, Laurie Thompson (a founder member) and Helena Forsås-Scott, the organisation remains strong, with 60 members at last count. It was especially gratifying to hear the level of enthusiasm expressed by members at the AGM in November for another major event with contemporary Swedish authors in the UK in 2016, along the lines of the stimulating day event held in November 2014 – the results of which are still being felt, including in the content of the latest issue of Swedish Book Review. The 2015:2 issue of SBR has been sent to over 30 editors at UK children's and young adult publishing houses, so they will know about SELTA and the excellent work our members produce. Members are encouraged to take a few minutes to log in to the Members' Area on the SELTA website http://selta.org.uk/members-login.php to ensure their contact details are up to date. The email and postal address you enter there are the ones we use within SELTA to contact you and to send copies of Swedish Book Review from Norvik Press, so it's important that your details are correct. It is also possible to edit member profiles and access various members' only documents providing tips, guidance and in-depth information. We're sure that 2016 will be another exciting year for SELTA. Gott nytt år och god fortsättning! SELTA's 2015 Annual General Meeting took place on the afternoon of Thursday 12 November. The meeting was held at the Society of Authors in London and saw a good turnout from members. Following the formal meeting, members enjoyed a talk given by Catherine Fuller and Sarah Burton, the Translators' Association's secretary and contracts adviser, respectively. The AGM covered a number of subjects, including a spirited discussion about membership rates and tiers, a report from members who attended the Gothenburg Book Fair, the proposal for future SELTA events and plenty of members' news about new commissions landed and publications forthcoming. After breaking for tea and biscuits, we welcomed Catherine Fuller and Sarah Burton. Catherine described what the Translators' Association can offer to its members, while Sarah provided practical tips on dealing with translation contracts. Following the close of the meeting, the committee and many members repaired to a nearby pub to continue their lively conversations. The annual August Prizes across various categories were awarded during a gala at the Stockholm Concert Hall on 23 November. 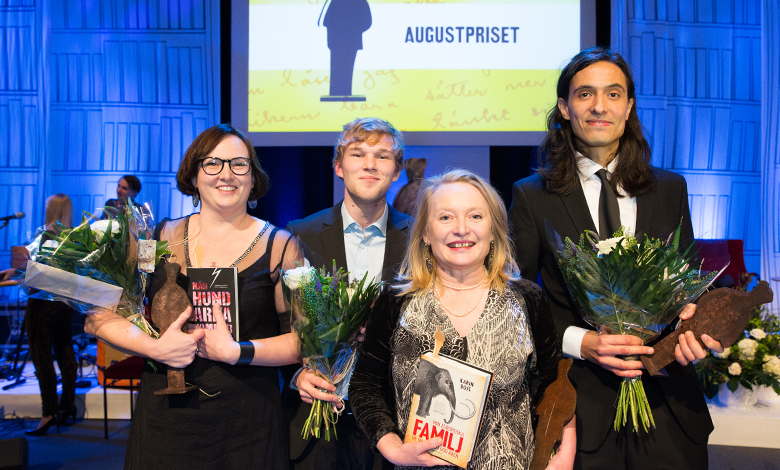 The August Prize was awarded across three categories: Best Swedish Fiction Book of the Year, Best Swedish Non-Fiction Book of the Year, and Best Swedish Children’s Book of the Year, with a prize of SEK 100,000 per award. The Little August Prize, an additional award, is worth SEK 15,000. Best Swedish Fiction Book of the Year went to Jonas Hassen Khemiri for his work Allt jag inte minns [Everthing I Can't Remember]. Best Swedish Non-Fiction Book of the Year went to Karin Bojs for her book Min europeiska familj [My European Family]. De senaste 54 000 åren. Jessica Schiefauer won the Best Swedish Children's Book of the Year for När hundarna kommer [When The Dogs Come]. Rasmus Bjerkander won the Little August Prize for Den på intet vis speciella [The (In No Way) Special One]. Reviews of several of these works will appear in the next edition of Swedish book review. Read more about the 2015 prizes here. We are deeply saddened to report that SELTA member and Director of Norvik Press, Helena Forsås-Scott, passed away on 13 July following a short illness. Helena was the founder and editor of the Norvik Press translation series Lagerlöf in English. She offered substantial to support to SELTA through her various roles in academia and publishing, and regularly encouraged her students to join the association. She was a long-term contributor to Swedish Book Review. Helena was Professor of Swedish and Gender Studies at University College London until her retirement in 2010. She then relocated to Scotland, where she was appointed as Honorary Professor of Scandinavian Studies at the University of Edinburgh. She was a pioneering researcher and a much-loved colleague, supervisor, mentor and teacher in the field of Scandinavian Studies in Britain and beyond. SELTA's thoughts are with Helena's family and friends. A brief obituary has been published on the Swedish Book Review website, and will be followed by a full piece in a future print edition. You can read it here. The Edinburgh International Book Festival​ programme for 2015 features a number of Swedish and Finland-Swedish writers, as well as a significant number of other Nordic authors. Tickets went on sale today and can be booked via the festival's website. It is with great sadness that we report that SELTA co-founder and former editor of Swedish Book Review, Laurie Thompson, passed away on 8 June 2015. Laurie was born in York and lived in northern Sweden for some years. He was Lecturer in Swedish at the University College of Wales, Aberystwyth and then at St David’s University College, Lampeter. Following the adoption of Swedish Books by SELTA and its rebranding as Swedish Book Review, Laurie became its first editor, serving from 1983 until the end of 2002. Despite illness, Laurie continued to work on his translations even while undergoing treatments. He translated Henning Mankell’s cancer diaries and his translation of Håkan Nesser’s The Living And The Dead In Winsford is due to be published in a few weeks’ time. Laurie also featured in the current edition of Swedish Book Review with a translated extract from Aino Trosell’s short story collection, Krimineller. SELTA’s thoughts are with Laurie’s family and friends. Read SELTA member Marlaine Delargy's obituary of Laurie here on the Swedish Book Review website. It will also appear in the 2015:2 print issue. An obituary of Laurie Thompson appeared in print in The Times on 23 June 2015. You can read it on their website (paywall) here. SELTA is delighted to announce that two of its members have been shortlisted by the Crime Writers’ Association for its Dagger awards. Ian Giles is featured on the shortlist for the International Dagger for his translation from Swedish of Andreas Norman’s ‘Into A Raging Blaze’. It has enjoyed critical acclaim from publications such as The Guardian, The Independent and Kirkus Review. A sequel in Swedish has been announced. You can read the review of the Swedish edition, originally published in Swedish Book Review 2013:1, here. Sarah Death is featured on the shortlist for the Non-Fiction Dagger for her translation from Norwegian of Åsne Seierstad’s ‘One Of Us’. Our congratulations to both Ian and Sarah. Fingers crossed that they enjoy success in their respective categories when the winners are announced on 30 June. The full shortlists are available to view in full here. SELTA is delighted to announce that two of its members feature on the Independent Foreign Fiction Prize 2015 longlist, published today. Also included on the longlist is Sarah Death for her translation from Swedish of 'The Ravens' by Tomas Bannerhed. Judge Richard Mansell describes the novel as an 'exquisitely told and acutely sensitive tale of loss'. Our congratulations to both Silvester and Sarah. Fingers crossed the 2015 prize is won by a SELTA member. To see the longlist in full, please click here. SELTA member Helena Forsås-Scott has been awarded a prestigious prize by the Swedish Academy. The prize, which is awarded as part of the Swedish Academy's annual Belöningar ur Akademiens egna medel [Awards from the Academy's Own Funds], is given to six people annually and is worth SEK 60,000. In her academic roles at UCL and Edinburgh, as well as in her editorship at Norvik Press and various other publications, Helena has played a major role in celebrating and promoting Swedish literature in the UK. SELTA would like to extend to Helena its warmest congratulations. Read the Swedish Academy's announcement of the award here [in Swedish]. 2014 was a busy year for SELTA - read the full story to see the highlights. SELTA aptly demonstrated its capacity to organise high-quality events for its members and hopes to build on this success in the future. In addition to the successful workshop and evening event, the society also enjoyed fruitful meetings held at the Embassy of Sweden and UCL. The association and its members featured prominently at the London, Gothenburg and Frankfurt Book Fairs, as well as notable prizes being awarded to several members throughout the year. 2014 also saw the launch of our brand new website. We have received a number of favourable comments about the new site for its fresh look and interesting content, and while there are still a few bugs to be ironed out, we believe the rebooted website will be a very useful means for us to inform publishers, readers, potential new members and each other about the work of SELTA and its members. If you have not yet visited our blog please do take the chance to do so - there are a number of good reads from throughout the autumn and early winter. We would welcome contributions for blog posts from SELTA members and wellwishers - if you have an idea please get in touch. For SELTA members, the move to a new site also means that you can now maintain your details directly via our "Members' Area", where you can – if you wish – create a profile for yourself in the Directory of Members. This only takes a few minutes to do. Changes you make to your details also update the central list of members used by SELTA for administrative purposes. The SELTA Google group has gone from strength to strength, with posts on a variety of topics during the year. If you are a SELTA member but not yet a member of the SELTA Google group and would like to join in the discussion, please email the Chair or Honorary Secretary for an invitation. With best wishes for 2015! Five leading Swedish authors of children's and young adult (YA) books travelled to London to take part in an all-day event attended by SELTA members, other translators and postgraduate students. On 7 November Per Gustavsson, Annelis Johansson, Cilla Naumann, Frida Nilsson and Malte Persson presented their books and discussed participants' translations of brief extracts from their works in a stimulating day of workshops and talks. SELTA is grateful to the Swedish Arts Council, the Anglo-Swedish Literary Foundation, UCL and the Embassy of Sweden for their support, without which this event would not have been possible. SELTA member Sarah Death has been awarded the medal of the Order of the Polar Star, a Swedish order of chivalry, for her services to Swedish literature and language abroad. Sarah has served as the editor of Swedish Book Review for over ten years and is a previous recipient of the George Bernard Shaw Prize (twice) and the prestigious Swedish Academy Translation Prize. SELTA congratulates Sarah on this great honour and thanks her for her hard work and dedication. Further details are available on the Sweden Abroad website. The next big thing for Swedish lit abroad? A panel at the 2014 Gothenburg Book Fair discussed the topic of what sorts of Swedish books might be the next to make a breakthrough in markets outside Sweden. The 2014 London Book Fair included a panel discussion of some of the lesser-known authors and genres from the Nordic countries. Susanne Bergström Larsson of the Swedish Arts Council (Kulturrådet) also spoke about funding opportunities to support Swedish literature in translation. The winners of the 2013 August Prizes have been announced. by Ellen Karlsson and Eva Lindström, Hippo Bokförlag. 2014 marks the hundredth anniversary of Tove Jansson’s birth. A range of new activities and publications demonstrate the UK's sustained interest in the literature and wider culture of Sweden and Scandinavia. on visual art, will be published in connection with the London Book Fair in April. The UK festival of Scandinavian culture, Nordicana, followed up on the success of its inaugural weekend last summer with a second event on 1-2 February 2014.